I came home from work and announced to Ken I was going to knitting camp this summer. He was only slightly confused. And, I suspect, not at all surprised. Well, knitting camp (yarn camp?) is a virtual camp where you work on a project for a month with other knitters around the world. The interaction (if you want it) comes from message boards, etc., online. I have had many friends who have done knit-a-longs or quilt-a-longs but I am usually up against a deadline for something, and have never done one.This camp is sponsored by the Loopy Ewe, which is both an online and regular knitting store, and they just moved to Fort Collins this spring, so I am lucky enough to shop there in person! Here are the details of the camp. The theme for this 3-segment camp is the Olympics, and so for the 1st project, you are to knit or crochet something that is designed by someone from a country other than the one you live in. When I checked on Ravelry and saw that the “Color Affection” shawl was made by Veera Välimäki, who is from Finland, I knew I was going to participate. 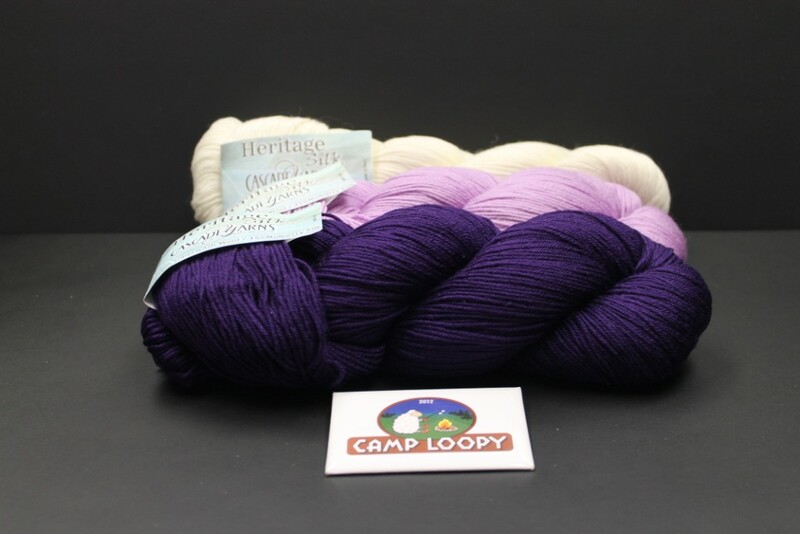 You are eligible for special bonuses if you buy your yarn at Loopy for the project (and I didn’t have any yarn that I liked for this project), so I went in and bought some lovely yarn. I looked at about a million pictures of the project on Ravelry (fiber arts website where knitters and crocheters plot to take over the world) and decided the ones I liked best had two pretty light colors for the first colors, and then a very highly contrasting color for the last colors. So that is what I went with. AND my camp badge. The bad thing is that you have to wait until May 27 to cast on, so of course I want to cast on Now Now Now but this will give me time to work on some other projects and hopefully finish them up. Speaking of other projects. I finally finished my youngest niece’s Christmas present. She doesn’t care, because she is only one. I don’t have to start being on time with her for another couple of years. It is a good thing, because she doesn’t have all of her baby quilts yet I make for each niece/nephew either. 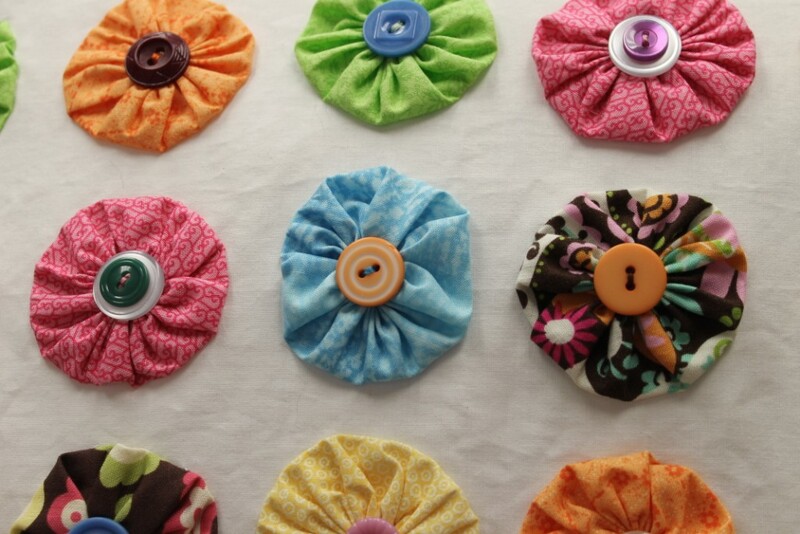 Yo-yo button pillow. All I can say is that it is very cute, but never again! 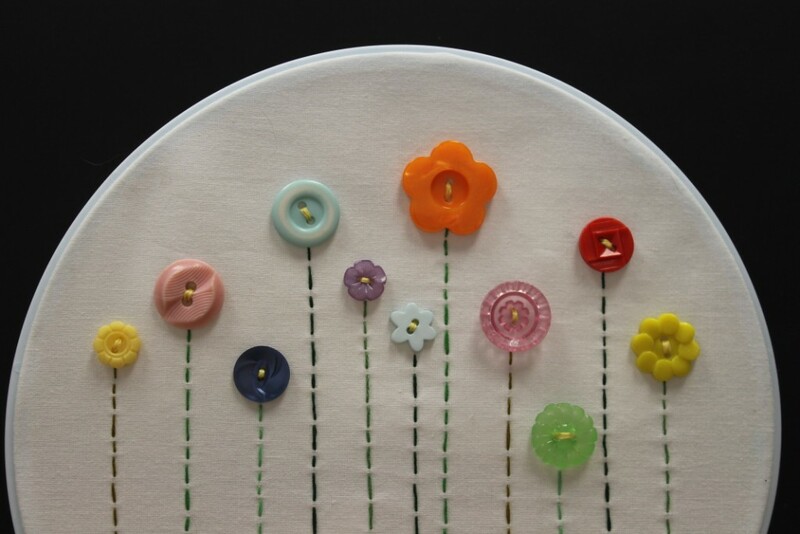 Those yo-yos and sewing them down, and the buttons, oy vey. My sister-in-law has a great talent for finding really cool projects that I will make one of and they say EEEEEEEEE! : ) The colors are a little wonky in the picture, those oranges and pinks and greens are not quite that bright. Then, my niece also had her 1st birthday last Sunday, so I just wrapped up that project. I would actually make this one again, it wasn’t too difficult. Another one that my sis in law found and sent to me. Tutorial here. 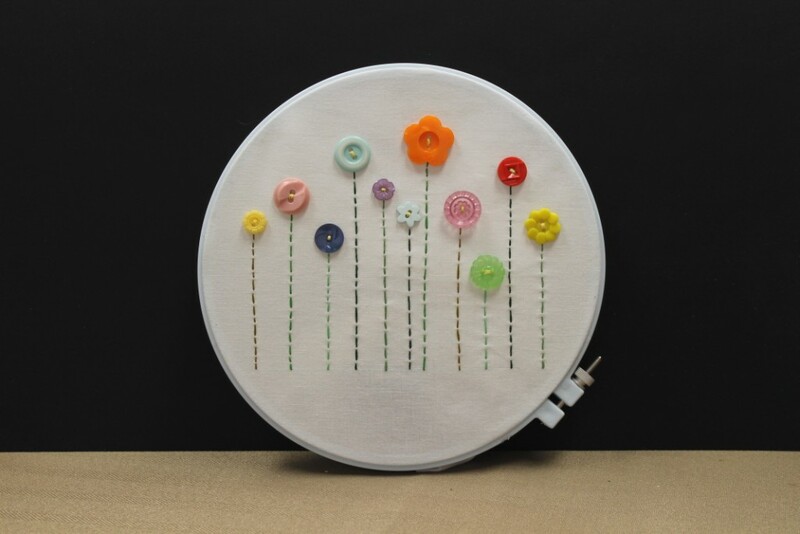 I don’t even have to supply the hoop for hanging, as she already has one! Now I just need to get them in the mail….. The other project I am currently telling myself I need to finish before starting anything new is a pair of socks for my mom. I thought I had them finished, and then when I blocked them, they seemed to grow. And if they were huge on me, I was pretty sure they would be huge on her. 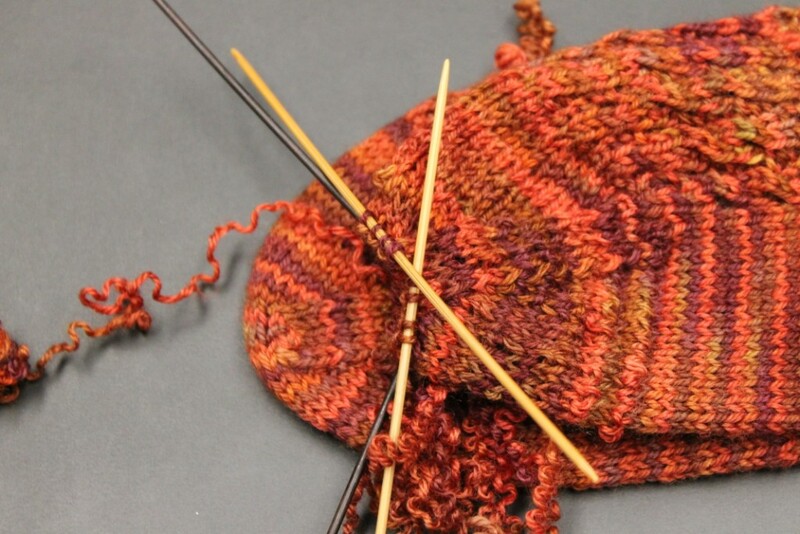 So I pulled the toe back out of one, and took about about 10 rows of pattern, and re-knit the toe. I think it is much better now. Both socks. They are actually a little browner than this. 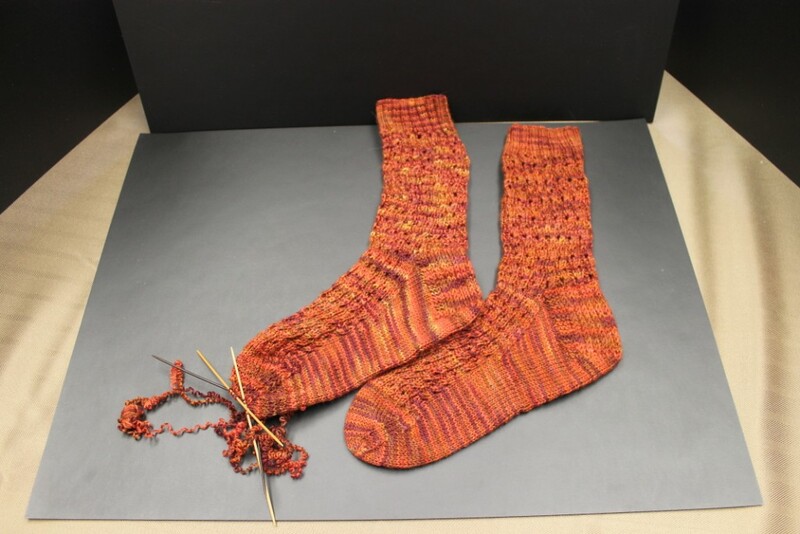 This entry was posted in Can this sock be saved?, Crafting, Knitting, Yarn Camp 2012 by glenderella. Bookmark the permalink. 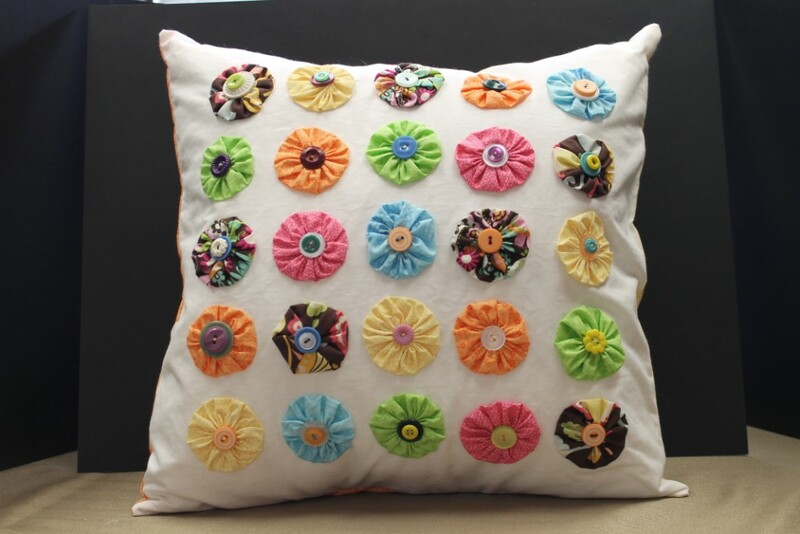 The yo-yo button pillow is great, and I love the embroidery button flowers!! Knitting camp sounds like fun! Love, love, love it all. 🙂 Your niece won’t even know she got them since she wasn’t too into opening gifts. But they will be perfect for her room. I will try to stay off Pinterest for Aunt Glenda projects for awhile. 😉 I have heard of Knitting Olympics where you start a project during opening ceremonies and finish by closing–have you done that? I have not done the “knit during the Olympics” thing but this third session of camp will coincide with the Olympics. It will extend beyond the closing session, tho, because it is a month long. That is probably a good thing in my case. I need to get her pieced quilt finished because the colors will go great (hopefully enter it in the fair this summer) and then I have a good idea for the topic of her embroidered quilt. Probably need to get K’s done first, tho…..since she will be 5 in October…good thing it has more blocks so it can be a little bigger, maybe even twin size. Oy vey.